For the main, we tried some of President’s Choice’s new, summer 2011 products (see the review below). 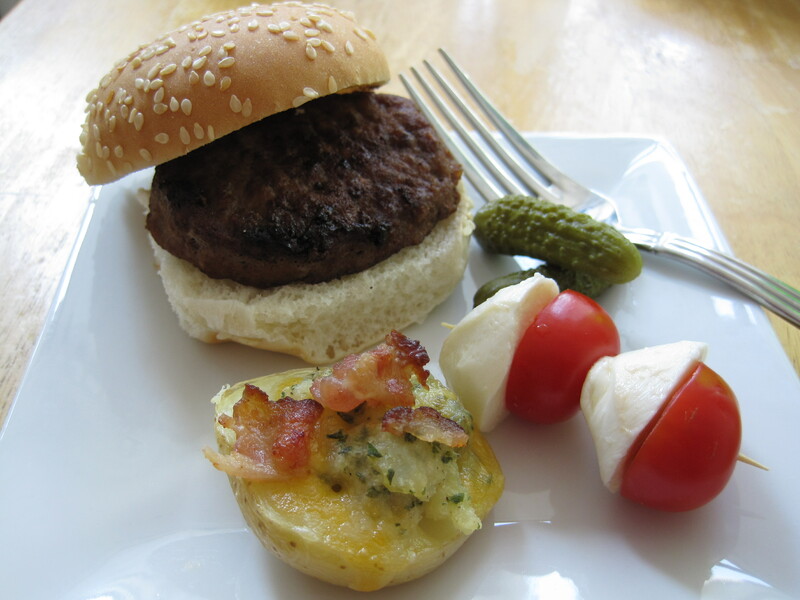 We served angus sliders on sesame slider miniature buns (shown in the photo above) and miniature sweet Italian sausages on mini top sliced hot dog buns (not shown because they were eaten so quickly). I wanted to serve the sausages on PC’s mini ciabatta buns, but the store was sold out of them. We cooked the angus sliders in a cast iron pan on the stove top over medium heat. They took at least 3 1/2 minutes per side to cook through. The mini sausages are pre-cooked and can be cooked on a grill or in the microwave. I normally avoid using the microwave, but the microwave option was the saving grace for our lunch and allowed us to serve the hamburgers and sausages at the same time. For the condiments, we had cornichons (also known as gherkins), ketchup, and honey mustard. For the sides, I made miniature stuffed, twice cooked, potatoes. These were everyone’s favourite part of the meal (see recipe here). I also made miniature tomato and boccincini skewers (shown in a photo above). I sliced President’s Choice gourmet cherry tomatoes in half. Since my boccincini balls were much larger than the tomatoes, I sliced those into thirds and then I cut the middle piece in half. I skewered alternating tomato and cheese “halves” onto toothpicks. I arranged them so that the cut sides were touching and so that the round sides created the look of balls that were 1/2 tomato and 1/2 cheese. The tooth picks were the perfect length for 2 balls, ie. 2 tomato pieces and 2 boccincini pieces (shown in a photo above). 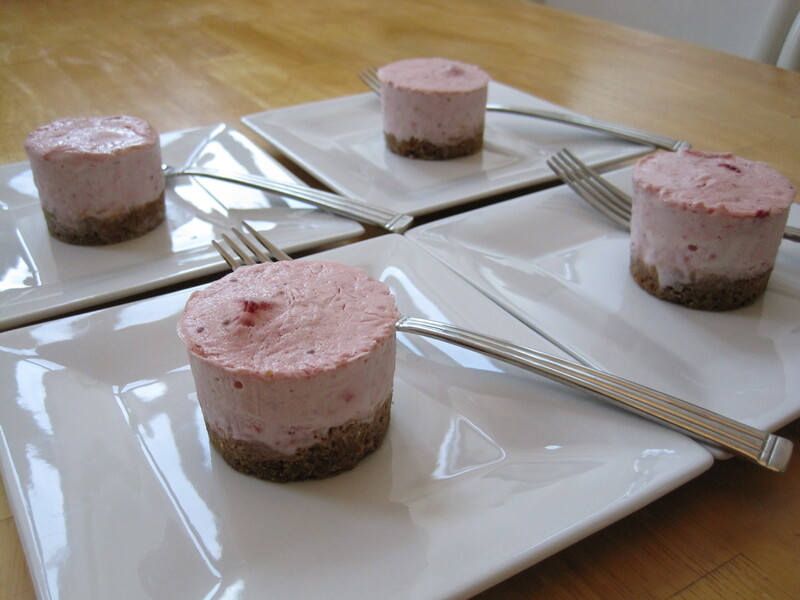 For dessert, I served miniature (individually sized) frozen strawberry pies (recipe here). President’s Choice (PC) has released a delicious looking line of miniature BBQ products. 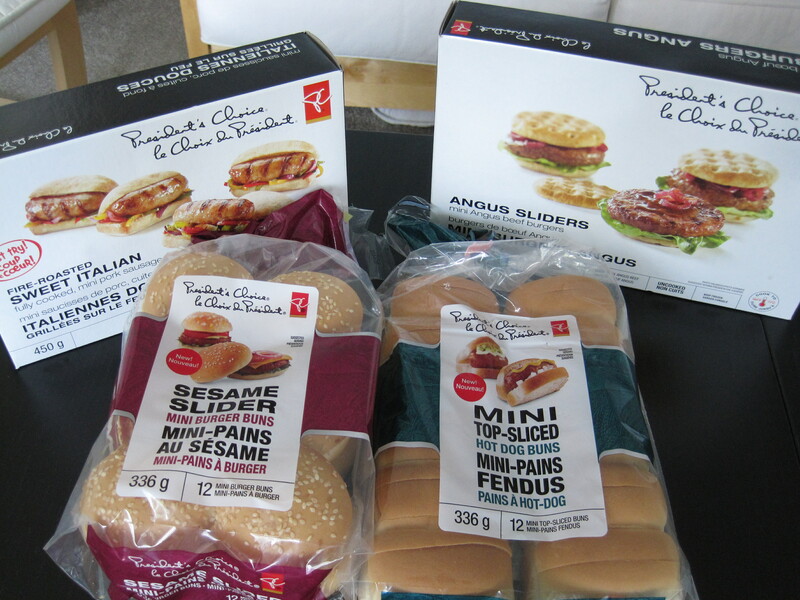 I am generally a fan of PC products and have always loved miniature food, so I was very excited to try some of their new, summer 2011 products. Angus sliders are miniature beef burgers priced under $10 for a box of 18. They can be cooked from frozen on the grill or in a pan. I cooked these in a cast iron pan and found that they needed at least 3 1/2 minutes per side to be cooked through. The burgers that were questionably cooked through were very juicy. These are good for processed burgers. Some of PC’s miniature bun options include : slider thins, sesame slider mini burger buns, and mini ciabatta pre-sliced burger buns. These are priced under $5 a bag. I like the slider thins because they showcase the meat. They work especially well if you cut the burgers up and serve them with toothpicks as hors d’oeuvres. I also really like the soft and standard sesame mini burger buns, and I think that they are more aesthetically pleasing, but the meat sort of gets lost in the bread. Note that the slider thins come in a package of 18 (as do the angus sliders), whereas the sesame mini burger buns come in a package of only 12. Unfortunately, I haven’t had a chance to try the mini ciabatta burger buns yet. Fire roasted miniature sweet Italian sausages are pre cooked and priced under $10 for a box of approximately 14. These can be cooked from frozen on the grill or in the microwave. We cooked them in the microwave and they were still delicious. I highly recommend these. I had planned to serve these on the mini ciabatta sausage buns, but the store was sold out of them. So, we used the mini top sliced hot dog buns. The mini hot dog / sausage buns are priced under $5 a bag and 1 bag of the mini top sliced hot dog buns contains 12 buns. Although the buns are nice and soft, I found that they were awkward looking with the sausage in them. Although I haven’t had a chance to try them, I imagine that the mini ciabatta sausage buns would look better. My only complaint about these products is that the sodium content is a bit too high, especially in the Angus beef sliders. They left me thirsty for the rest of the day. Note: For our miniature BBQ, I also used PC naturally smoked, sodium reduced bacon and PC gourmet grape tomato trio. The bacon was good but still too salty for me. The tomatoes were very fresh and very flavourful and definitely made a difference to my simple mini cherry tomato and boccincini skewers. Overall: I recommend that you try President’s Choice’s miniature BBQ foods for entertaining in the summer, especially if you’re short on time and/or help. Thanks to these products, we were able to put together a great lunch for 5 people with only 2 hours notice. Well said, I could not agree more with you on this issue. I think your website is very popular on this topic judging by all the other comments posted to it. I just wanted to leave a comment to appreciate your hard work.